The save the IAA campaign is calling for students and staff across the university to take action on the university open day on Saturday the 24th November. 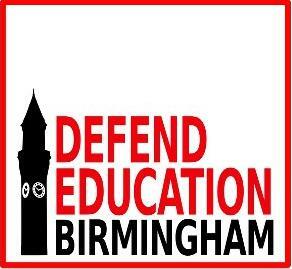 We are calling an organising meeting on Thursday the 22nd of November, at 5pm in the Guild Council Chambers; to discuss co-ordination for this. We hope that as many staff and students as possible- especially those at most risk from course closures- attend. What is happening at this university is a systematic process of hampering, reviewing and then substantially restructuring or removing the course they don’t like. In the last three years Sociology, Biological Recording, English Language and Literature in Education, Cultural Studies, Archaeology and Antiquity, Nursing, Physiotherapy, Religious Studies and Theology have all been- or are at risk of being- substantially restructured or closed altogether. However this process does not just affect these departments. Across all departments we have seen a systematic process of review and a reduction of money the university spends on its core function of educating students and research. The university cannot attack staff and students in the way it has done without expecting to face the consequence of their actions. We call on the university to immediately halt course closures and compulsory redundancies and pledge not to make any more for the next three years. If the university is to progress and get better it can only be by working together with both staff and students, not in total opposition to them. The proposal is not unrealistic it has happened at other universities, notably Glasgow. Apologies for the lack of posting in the last few months, this blog is an attempt to draw together all the information about the closure and the campaign against it from elsewhere on the web. With the cuts and restructuring that is facing the IAA we believe that this is the perfect time to celebrate the unique approach which the institute offers. We should be making an extra effort to highlight the important achievements of the IAA in education and research and we would be delighted if you would join us. This year the people from and friends of the IAA will be once again visiting the ancient site and one of Britain’s most iconic landmarks; Stonehenge. On Saturday 18th August at midday we shall be meeting at the Cursus Ridge Barrows, Stonehenge, which has been investigated as part of our recent ‘Stonehenge Hidden Landscape’. 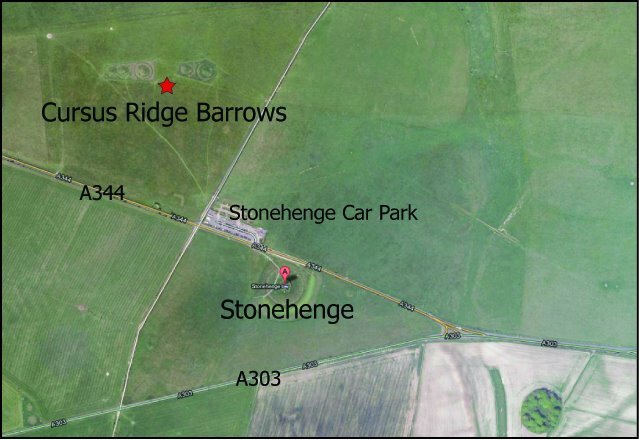 From here our specialists will be giving guided tours of the Stonehenge wider landscape. Everyone is welcome to join us for what promises to be an exciting afternoon of celebration and reflection on the past whilst anticipating what the future of archaeological and historical research and education have to offer. This is yet another UCU article which I am cross posting to this site. If anyone wants to write an article about the IAA and the closures then please get in touch and we would love to post it here. 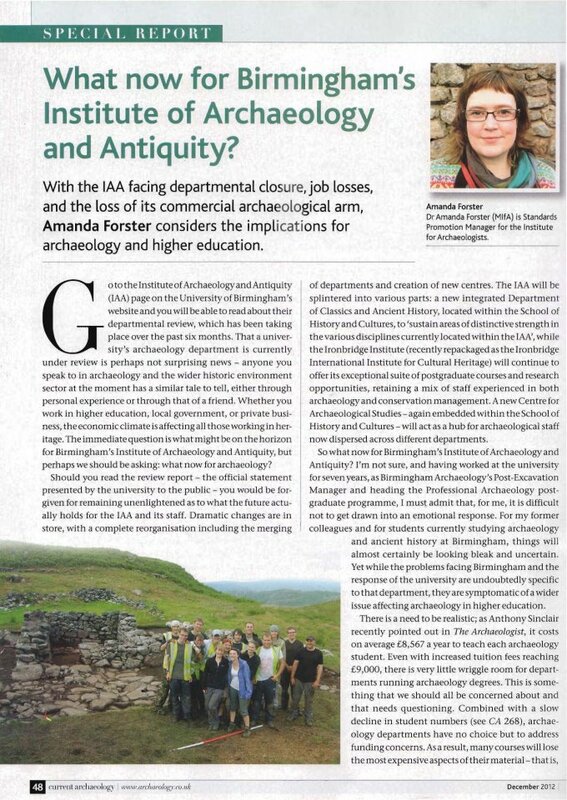 The University of Birmingham has announced plans to axe its award-winning Institute of Archaeology and Antiquity (IAA), with the loss of 19 jobs. The internationally renowned department has played a leading role in recent discoveries at Stonehenge, including the groundbreaking find of ancient ritual pits which suggest that the Stonehenge site was used as a place for sun worship before the stones were erected. UCU said the institute’s closure would have a devastating impact on the UK’s archaeology provision. The union said it was angry that staff affected by the closure had not been given any proper explanation of why the institute was being axed, despite raising the issue with management on several occasions. In 2007 the institute was awarded the Queen’s Anniversary Prize for Higher and Further Education for its use of technology to create detailed maps of the former Roman town of Wroxeter. Staff from the institute also helped excavate the Staffordshire Gold Hoard, the largest hoard of Anglo-Saxon gold ever found, ensuring that the ancient gold was extracted safely from the ground where it was discovered. Academics from the institute have helped carry out excavations outside Shakespeare’s final home as part of the Dig for Shakespeare project, which is looking to increase understanding of how the Bard spent his last years. 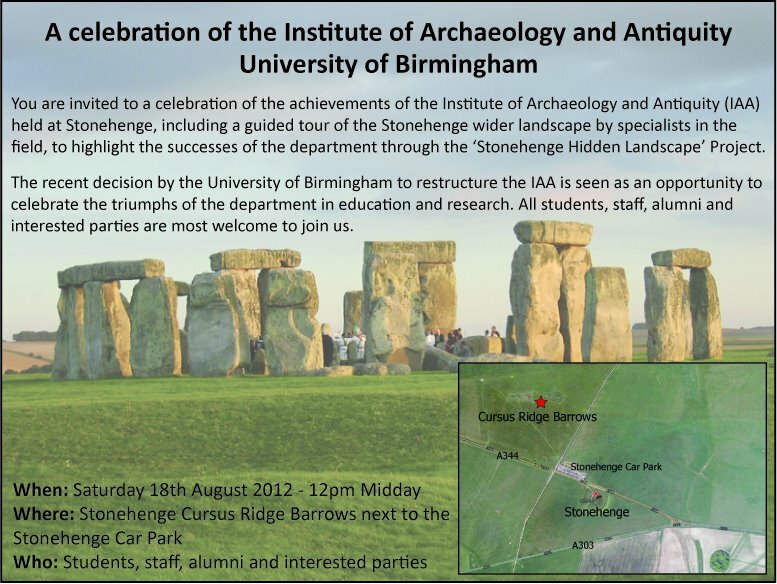 UCU regional official, Martin Machon, said: ‘The University of Birmingham’s Institute for Archaeology and Antiquity is internationally renowned for its work and has played a leading role in recent Stonehenge discoveries and other high-profile projects. 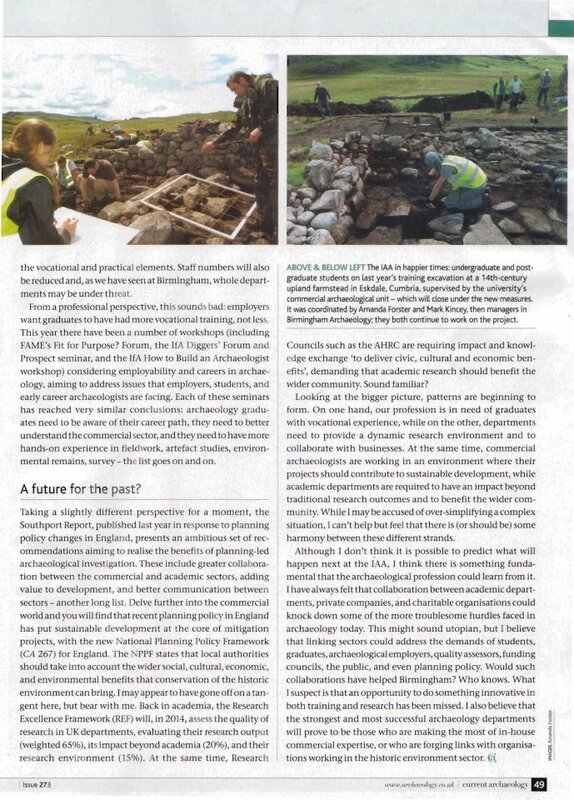 Closing this award-winning department and sacking staff will seriously damage the UK’s proud reputation as a leading light in archaeology. It is felt by many people who are going to be affected by these proposals as well as other interested people that the placement and length of the consultation period is inadequate. It is currently placed other the Summer Break which makes it difficult for undergraduate students to be properly consulted. For this reason we are formally asking for the university to extend the consultation period and we have created a petition which we ask you to sign. Whilst this is not a petition directly against the recommendations of the review if it is successful it will allow us to more fully critique and oppose the proposed changes. “We, the undersigned, believe that whilst the review and consultation process of the proposed Institute of Archaeology and Antiquity (IAA) merger with the School of History & Cultures is in keeping with the rules and regulations of the university, it is still of an unsatisfactory standard for the students of both schools involved. The 90-day consultation has been started at a time when many students have already returned home for the summer break, and the commencement of the consultation was not announced to all implicated students until after lobbying by student representatives. The consultation is due to end before the start of the 2012/13 academic year, and as such will come to an end before undergraduate students return to the university. • All Professorial staff are excluded from the threat of redundancy, despite the assertion that the IAA has been failing for a number of years and the questionable leadership of sections of the Professorial staff in leading to such failure. • The composition of the review panel consisted largely of senior members of the unit under review. • The review took only one month to complete, with only one hour allocated for staff to meet with the review panel. This compressed timetable is unprecedented, and made it extremely difficult to make coherent and collaborative responses. • A group grievance was lodged by the Project Group with HR concerning serious problems with senior IAA management.